…when posting just feels like keeping the blog going rather than having anything to say. So why say anything? 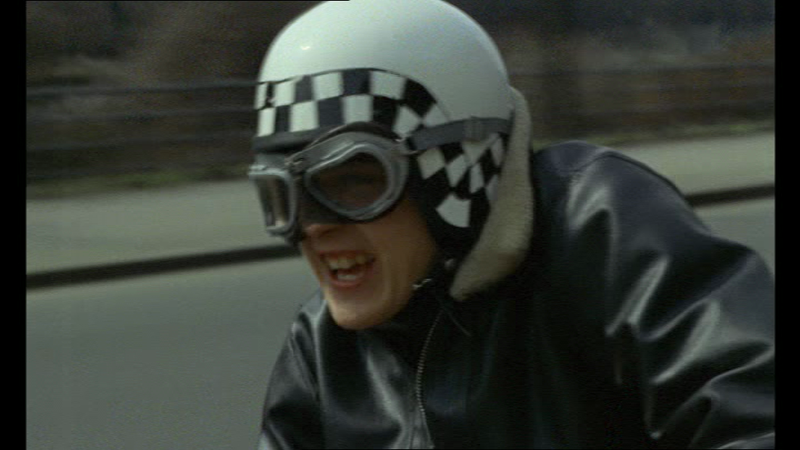 Here is a photo of David Hemmings as a tiny bee. Interactive bit: use the “Search” function to the right on the main page (scroll down) to look up your favourite movie, person or thing, and read an old post about it. Then leave a comment. I like it when old posts come back to life. Further down is a “Recent Comments” bit where you can see if any other old posts have attracted comments, and join in. Blog archaeology! “Let’s revisit the scenes of our youth,” as Louis Jourdan is always saying. 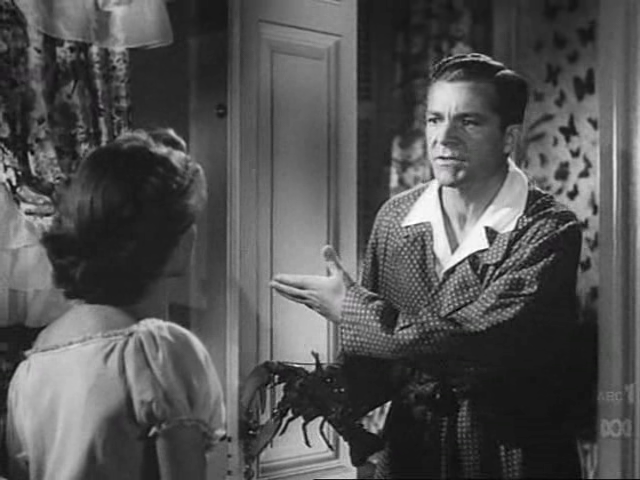 Dana Andrews and Lilli Palmer adopt a lobster. Pauline Kael admired it. Its own director dismissed it. 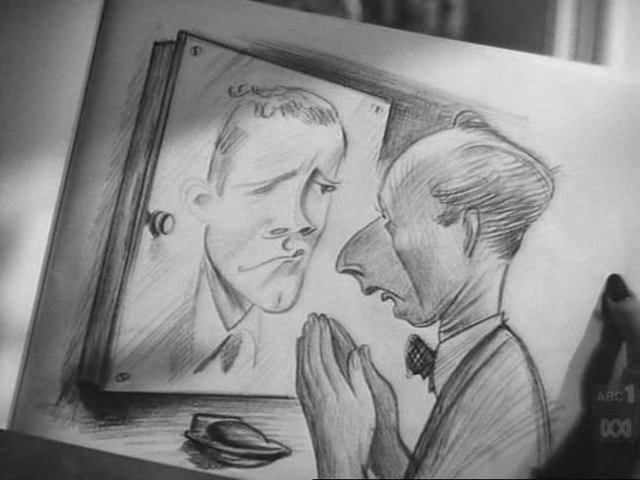 But neither of these facts need unduly influence us — like it or love it or hate it or be indifferent, NO MINOR VICES (1948) is a very odd, original little film. I say “original,” but it should first be admitted that Lewis Milestone’s film shares a central set-up with Lubitsch’s THAT UNCERTAIN FEELING, in which Merle Oberon is tempted away from her bourgeois married existence with Melyvn Douglas by a romance with neurotic New York artist Burgess Meredith. Well, in NO MINOR VICES, substitute Lilli Palmer, Dana Andrews and Louis Jourdan and the rest can stay as it is. But it doesn’t, exactly. Whereas Lubitsch did what Lubitsch does, hampered by the fact that his leading man and leading lady were capable but not fiery, and his comic antagonist is very funny but not quite appealing enough, Milestone has perfect leads and still amps things up furiously with expressionist tricks, cartoon sound effects, imaginary sequences, hallucinatory POV shots and various other shenanigans supplied by Arnold Manoff’s script. Lilli Palmer is charming and beautiful as usual, Dana Andrews is wonderfully understated as usual, and both demonstrate how to turn their dramatic gifts to the services of outrageous screwball comedy. The real surprise, though, is Jourdan, who supplies the outrageous screwball element, flamboyant and wild-eyed, a little camp, and very intense, like the light comedy version of Bruno in STRANGERS ON A TRAIN. Milestone happily serves up the required japes, but we never forget he’s a proper director: he’s able to send up the tricks of dramatic filmmaking by pushing them too far or by applying them to goofy situations, and some of his compositions are just beautiful. 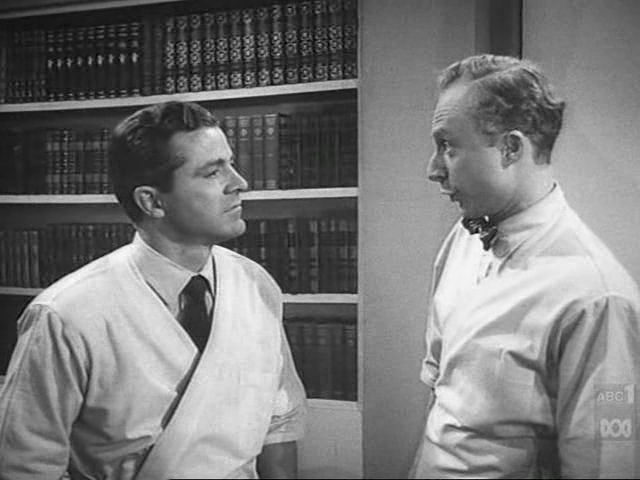 Strong support from Norman Lloyd as a milquetoast pediatrician. It seemed odd, hearing the familiar velvet voice of the man who pronounced Fiona and I man and wife, issuing from this boyish fellow. 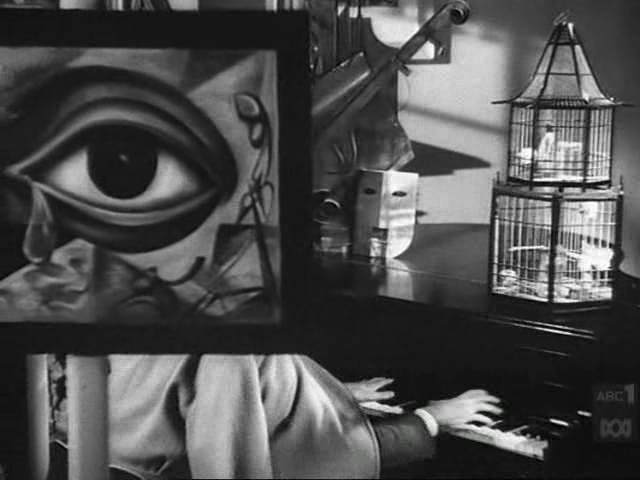 Cinematographer George Barnes also worked on SPELLBOUND, so the modern art elements must have been up his street. Funny how in high-class Hollywood movies modern art is always represented by Dali knockoffs and modern music by ersatz Gershwin. Here, Franz Waxman delivers suitable variations on Rhapsody in Blue so we get both at once — a rich pudding indeed. I’d love to know who did the drawings Jourdan tosses off — perhaps somebody out there will recognize the style? Norman has a fine collection of newspaper cartoons of himself, but he doesn’t seem to have this one. I hope the original was preserved.